In this post I’ll share a script I developed for a customer to find which connectors are used by which PowerApps apps. Currently this is not something available through the Power Platform Admin Center. Feel free to use this script as you see fit. This script is provided as-is without any warranties of any kind. If you update or adapt it and decide to re-post please provide attribution. You may notice that the output contains a complex property for the Connections. It has been some time since I worked with formatting output in PowerShell. If you have an improvement to the formatting please share back suggestion and I’ll update the sample script. A big thank you to everyone that attended my PowerShell for Your SharePoint Toolbelt at Dogfood Con this year. We packed quite a few demos into the 60 minute session. My slides and demo scripts are below. This was the first year of the Microsoft Ignite conference which merged a number of previous conferences including TechEd, SharePoint Conference, Project Conference, and more. With over 23,000 attendees, a new venue, and numerous Microsoft senior leadership and product group in attendance (including CEO Satya Nadella himself) this was definitely a huge event. Rather than re-capping the event itself I wanted to take a minute to mention a few items that I heard / saw at the conference. I am still downloading and viewing a number of sessions that I couldn’t attend (same time as another session or room was at capacity) but these are highlights that I wanted to share with others. No “internal” FIM in SharePoint 2016 – SharePoint 2016 will not ship with a version of the Forefront Identity Manager product included. This is a fairly big deal for any customers that are using the “SharePoint Synchronization” option (allows for import and export of content to / from SharePoint) for the User Profile Sync in 2010 or 2013. Your options in 2016 will be the Active Directory Import (same as 2007 and re-introduced in 2013) or “external” FIM which is installed and managed outside of SharePoint Server. See the following resources for more details and how to install FIM 2010 R2 + SP1 with SharePoint 2013 so that you can start planning today if you do need the full features of syncing data into and out of SharePoint. Project Siena – Project Siena looks like a viable alternative (not replacement) for many (smaller) custom development scenarios. Essentially it is an app that lets you build other apps. I do not see this replacing InfoPath, Lightswitch, and half a dozen other technologies that have popped up over the past few years but I do see a promising future for this technology (HTML5 + JS based, similar to many other tech stacks that Microsoft is promoting). Note that it is still in a beta release last time I checked but the fact that it caters to the Excel power user with similar syntax merged with an easy drag and drop interface feels like this could gain traction better than some other tools. If you aren’t familiar with Project Siena you really need to see it to understand it. New SharePoint hybrid search option – Hybrid search is receiving a huge update / upgrade later this year. In it’s current (May 2015) form SharePoint hybrid search involves separate search service applications / indices for on-prem farms and Office 365 / SharePoint Online. If you query one source you can federate the query to the other and get results in a separate result block. The problem though is that configuration can be fairly complex, search results aren’t integrated (in-line with each other), and you likely have a large number of servers on-prem for the search service. Later this year (target timeframe, subject to change) Microsoft will release an update which will allow an on-prem “cloud search service application” to crawl and parse content but then push the metadata up to Office 365 for indexing, querying, etc. The massive benefit of this is that your on-prem content will then be able to be used in other services like Delve, Office 365 data loss prevention (DLP), and others that currently have no expected on-prem release (or won’t be supported until future releases of SharePoint). Additionally you will need a much smaller on-prem server footprint to support search (the example given was going from 10+ search servers down to 2). This is a big win in my opinion and I can’t want to test it out when it is released. Nano Server – Nano Server is a new installation option for Windows Server 10 (Server 2016 or whatever the final name ends up as) akin to Server Core in the past. There were a number of sessions that talked about how small the footprint of Nano Server will be (400MB, yes MB compared to 8+ GB of server + GUI “full” edition). The changes that this introduces not only affect performance but also re-architecting tools to work remotely (there is no local logon or UI for Nano Server, everything must be done remotely). Things like Event Viewer, Task Manager, Local Services, etc. can be accessed remotely in a web UI similar to the “new” Azure Portal UI (super slick, take a look). This may sound scary to some admins who are used to having RDP or locally logging on to a server but listen to Jeffrey Snover’s take on this. We are IT Professionals and this is a technology that will reduce number of reboots, make servers more secure, reduce infrastructure footprint, and have numerous other benefits. You owe it to yourself and your company to learn about this and see if it will work for the services you provide. PowerShell – Getting to see Jeffrey Snover (inventor or PowerShell) and Don Jones (first follower of PowerShell, see the link in slide deck) geek out about PowerShell was one of the best sessions I got to see at Ignite. Hard to describe in words hence I recommend go watch the recording. Jeffrey had some great advice about using PowerShell as a tool to explore and dive into problems or scenarios you are trying to solve. That sense of adventure can be a motivating force for your personal and professional careers. It was really inspiring and I love the fact that Jeffrey (and Don’s) mindset is spreading to so many others these days. On a side note I also wanted to mention one of the obvious but not always talked about benefits of going to a conference like this in-person. During the week I was able to introduce myself to a number of presenters that I had previously not met. Some were MVPs, fellow Premier Field Engineers (PFEs), product group members, and more. The connections you make can last for years and provide an invaluable network for sharing information and getting assistance when you are in need. 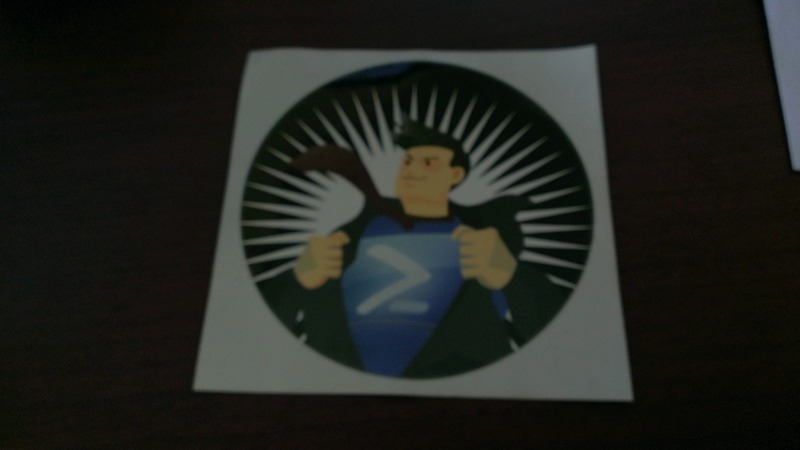 I even got a PowerShell sticker directly from Jeffrey Snover himself (another personal highlight). This is just a short list of some of the sessions that I attended along with highlights or key points that I wanted to share. If I find anything else significant from the recordings I am going back to watch I’ll update this post. For now though go check out the recordings above or the hundreds of other ones that are up on Channel 9. I encourage you to attend next year when Ignite 2016 will be in Chicago again May 9-13. I was pleased to once again speak at the Dog Food Conference here in Columbus, OH. I believe this is the 3rd year that I have spoken and the 4th or 5th year that I have attended. The venue has moved to a more spacious location which definitely helped with giving attendees, speakers, and vendors more room to spread out, I was especially happy to meet up with dozens of previous customers and co-workers at the conference. 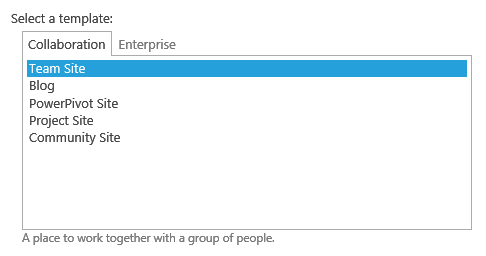 This really is a great mix of audiences (developers, IT pros, and business users), customer segments, and topics (SharePoint, .Net, PowerShell, BI, ALM, and more). Thanks to everyone who attended my session at the very end of the last day of the conference. We had a number of good side discussions and questions throughout the presentation. Below are my slides and scripts. Recently I had a request from a customer to find which SharePoint 2010 / 2013 lists are using InfoPath forms for their data entry (also known as enterprise forms for a SharePoint list). In this post I will show you a PowerShell script to determine if a SharePoint list is using InfoPath forms. As you may have heard, InfoPath as a product will not be receiving any future releases (see InfoPath roadmap update blog post). Being able to find SharePoint lists using InfoPath forms may be useful to you now. Special thanks goes out to Joe Rodgers (fellow PFE at Microsoft) who helped me narrow down the specific properties to look at. The property that we want is not at the base of the SPList properties nor on the SPList.Forms properties like I had hoped. Instead you will need to dig a few levels down. I found the property at SPList.ContentTypes.ResourceFolder.Properties[“_ipfs_infopathenabled”]. If this setting is true then your list is using InfoPath forms for data entry. If it is false then it is using out of the box SharePoint forms. This script will determine if a single SharePoint list is using InfoPath forms or not. You could easily expand this to work with multiple lists or sites (similar to my PowerShell Script to Determine Number of Files in SharePoint 2010 or 2013 Document Libraries). Feel free to adapt the above snippet in this post to your needs but please attribute rights if you republish. I had a customer request recently to limit the which site templates were available to end users to create subsites. Below is a short PowerShell script to do just that. If you are using a Publishing Site you can restrict the available site templates by going to Site Settings –> Look & Feel and clicking on Page Layouts and Site Templates (see following screenshot). If you are not on a Publishing Site then there is not an easy (supported) way to accomplish this through out of the box means. The SPWeb class has methods GetAvailableWebTemplates and SetAvailableWebTemplates that can be used in conjunction with each other to get the current list of templates and then filter down to only the desired templates. The filtered down results can then be set and updated on the SPWeb. A version of this script can be downloaded from the TechNet Script Repository: Limit available web templates for a SharePoint site. Note: Be sure to modify the “<URL of site>” to your site’s URL and also change which templates to keep (line 2). Before you run the script you will see the original list of available web templates when creating a subsite. After you run the script you will now see only the templates which you listed in the templates to keep. If you need to reset the list of available web templates you can execute the AllowAllWebTemplates method on the SPWeb object. I had run across a few other samples for limiting web templates that involved modifying out of the box SharePoint files (changes which may be overwritten by future updates or patches, and thus not recommended). This process of using the SetAvailableWebTemplates() method appears to be a bit more safe and supported.